Summer horseback riding camps are for the truly horse obsessed! Do you dream of riding horses? Want to learn everything you possibly can about horses and horseback riding? Do you love breathing in the smell of horses? If you want to learn about horses and horseback riding all day for a week or more, summer horse camp is for you! Some are day camps, and others are sleep away horseback riding camps. Day camps are available in half day and full day versions. 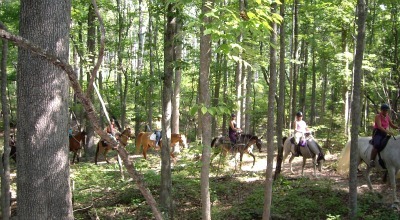 The full day summer horseback riding camps would typically run from 8 or 9AM ending anywhere from 3:00 to 5:00 PM. The typical day would include a riding lesson, learning about horse care, a craft, lunch break, and more horse time. Quite a few camps partner with local pools to add in swimming time, too. After all, it is summer and can be hot! It can be refreshing to take a dip in a cool pool (or pond) after riding horses and taking care of them all morning! At an overnight horse camp you’ll do all the above plus sleep in a cabin or bunkhouse at night. -How much time will I have with the horses? How much of that will be riding and/or lesson time? -What discipline will I be learning at camp? What ages and ability levels will the other campers in my group be? -How many years has the camp been running? Do you have any past campers I can call to see how they liked it? -What is the return rate for camp counselors and instructors? If it is a really high turnover ask why. -What other activities do you offer? -Can I come visit before I sign up? I recommend this to double check on the quality of the facility. -You may also want to call a local large animal vet and see if he knows anything about the camp and how the horses are cared for. Healthy horses are happy camp horses! 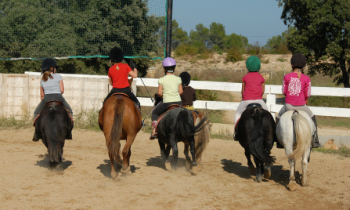 Riding lessons will vary for what kind of stable or instructor is hosting the camp. Some camps offer western horseback riding lessons, while others will offer English riding lessons. Some camps may offer a trail riding focus. With whatever focus, you are going to learn horseback riding (or driving or even vaulting)! So ask ahead what style or discipline the trainer teaches. Camps are generally grouped by ability level and usually by age. If you are new to horses, check out my horseback riding for beginners page for some pointers on handling and riding horses. This page will also highlight some of the horse riding gear you will need, most importantly a helmet (most camps will provide this) but be sure to check with the camp you choose as they will have their own requirements for what kind of clothes and shoes you’ll need. How many lessons, how often and how long they are will vary from camp to camp so be sure to check out what the camp you are interested in offers. It would be great to ask how much time you will be spending with the horses per day, and how much of that is riding time. Most camps do at least a one hour lesson a day. Campers are also usually assigned a horse for the week, but ask to make sure. 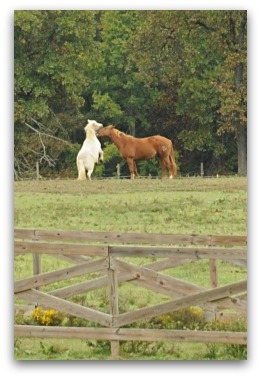 You may have your own horse or you could be sharing a horse with someone. Many camps will also do a small show as a wrap up for the end of the week so you can show off your new and improved riding skills! At summer horseback riding camps if you don’t already know how, you will learn how to groom a horse. This will include brushing and cleaning out his feet before riding. You may see a demonstration about clipping a horse. You may learn how to braid his mane and tail for a show and how to give him a bath, too. After all, a summertime cool shower can feel good to your horse too! You’ll love sudsing him up and getting him sparkling from head to hoof! My favorite part is washing the horses tail! I love to dunk the tail in a sudsy bucket full of yummy smelling horse shampoo water! Other topics of horse care may include basic equine first aid, learning normal vital signs and how to tell if your horse is sick or lame. The sky is the limit with summer horseback riding camps but you may watch videos on topics from horse handling on the ground to basic equitation. Your camp counselor could teach you the names of all the horse equipment and the parts of each piece. You may also learn all the names of the parts of the horse. It’s great to know the lingo of horses so soak it in! Besides offering a taste of every horse discipline from dressage to vaulting, summer horseback riding camps generally have many other activities you can participate in. Some of those are arts and crafts (some horse related), pottery, hiking, swimming, scavenger hunts, and archery. If you are staying overnight, you may play more games and sing camp songs around the fire.